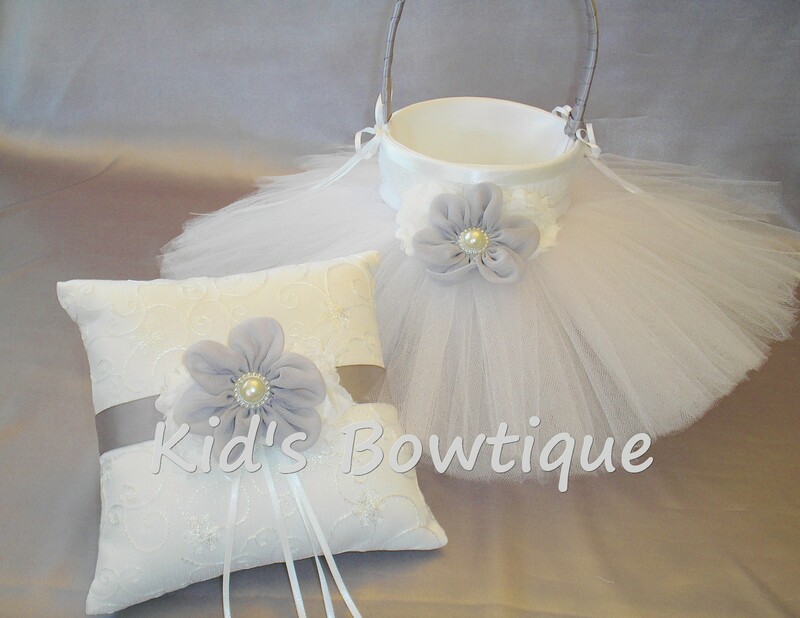 Kid's Bowtique has designed a wedding flower girl tutu basket and matching ring bearer pillow set that is beautiful and unique for any wedding. Custom Flower Girl Tutu Basket: The tutu basket is accented with a white tulle tutu for uniqueness. Pictured is a pure white tulle tutu. We can sew any color tutu on the basket to match your wedding colors. A pearl center flower plus 2 white shabby flowers are sewn to the tutu for color. The basket is a standard flower girl basket size (approx. 4.5X5). Matching Ring Bearer Pillow: The matching ring bearer pillow is accented with the same flowers. We know every bride is unique and wants her wedding day to be special. Let us create that unique flower girl basket and ring bearer pillow for you. E-mail us with questions about this set or to create a unique set just for you. Tutu color, flower colors, flower style, etc. can be adjusted to match your wedding colors.